Surprise Winner Of Congolese Election Is An Opposition Leader Felix Tshisekedi was declared winner of the long-delayed election. Another opposition candidate, Martin Fayulu — who had been considered the frontrunner — called the results rigged. 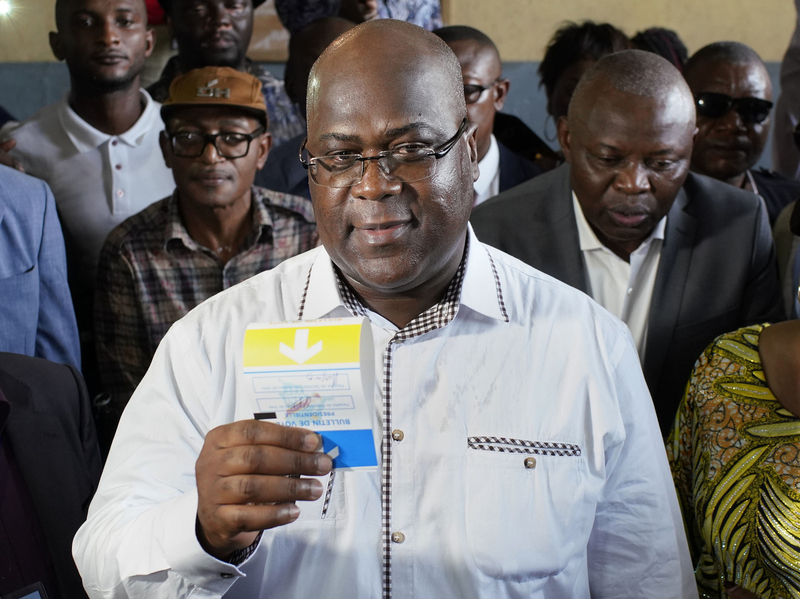 Opposition presidential candidate Felix Tshisekedi casting his ballot in Kinshasa. Tshisekedi won the election amid concerns of vote-rigging. The Congolese capital of Kinshasa is reported relatively quiet early Thursday morning as the nation's electoral commission waited until the wee hours to declare opposition leader Felix Tshisekedi the provisional winner of last month's long-delayed presidential election in the Democratic Republic of Congo. But runner-up Martin Fayulu is disputing the results, condemning the election results as "rigged, fabricated and invented," according to the Associated Press. With 7 million votes, or 38 percent, Tshisekedi outpaced Fayulu, another opposition frontrunner, who came in second with more than 6 million votes. The governing coalition's candidate Emmanuel Ramazani Shadary came in third with more than 4 million votes. In an interview with Radio France International, Fayulu denounced what he called an electoral coup. "Ridiculous," he said. "These results have nothing to do with the truth of the polls. This is an ugly swindle of [DRC's Electoral Commission President] Mr. Nangaa and his political camp. It's a real electoral coup, it's incomprehensible. I ask the Cenco, the Church of Christ in Congo, the Symocel and all those who observed the elections to tell us the truth, to publish the results. (...) The Congolese people will never accept that his victory be stolen." "Some observers have suggested that President Joseph Kabila's government sought to make a deal as hopes faded for a win" for Shadary, the AP reported. NPR's Ofeibea Quist-Arcton reports from Kinshasa that the results could lead to protests and allegations of rigging. "The influential Catholic Bishop's Conference, which fielded 40,000 observers, says the outcome of the much-anticipated vote is at odds with its tally. Last week the bishops said their observations showed a clear winner – although they did not name Martin Fayulu, the other opposition frontrunner – as that candidate. So Tshisekedi's apparent victory may become subject to a legal challenge and protests." The church had thousands of observers stationed at voting centers throughout the country to record voting tallies, the Associated Press reports. "The figures compiled by the Catholic Church showed that Fayulu won an absolute majority of the votes," the AP says, citing "several diplomats briefed on the matter." Two of the diplomats said other observation missions, including one conducted by the African Union and one by the Southern African Development Community, also shows that Fayulu received the most votes, the AP reports. The second-place winner, Fayulu, has not yet indicated whether he will contest the results. Earlier, he said that the results were "not negotiable" and that election officials should not "disguise the truth." He also made it clear that he was not looking for any deal with Kabila's governing coalition. The election, delayed since 2016 and marred by allegations of widespread irregularities, eventually occurred on Dec. 30. The results were originally scheduled to be released on Sunday, Jan 6. As the central African nation of 80 million people awaited the election results, riot police with water canon were deployed around the electoral commission and Kinshasa's main boulevard in anticipation of possible unrest. Felix Tshisekedi is the son of Congo's historic opposition leader, Etienne Tshisekedi, who died in 2017. Term-limited President Joseph Kabila is due to step down after 18 years in power. His term was to have ended in 2016, but he successfully delayed the election until December 2018. Critics charged he used that two-year period to prolong his presidency, violently suppress the opposition and hand-pick his preferred successor. In face of rising tensions associated with the elections, the U.S. Embassy in Kinshasa had issued an alert warning Americans to leave the mineral- and metal-rich country, prone to rebellions and conflict, mainly in the often-troubled east, where the authorities suspended the presidential vote in two opposition strongholds at the epicenter of an Ebola epidemic, citing health concerns about the virus spreading.